View the threads thistlesifter has started. Leave feedback for thistlesifter or read feedback left by other members. View the member feedback thistlesifter has written of others. "I collected first plant at age 13 in 1954. There was no nursery in the small OK town then. We have a hilltop place in North San Diego county for the last 24 years. its 1.82 acres. About .75 acres is landscaped. and has been redone several times as we learned what fits in San Diego county. This area, about 7 air miles from the east Pacific coast, is recognized as one of the best desert plant growing areas on earth. And that is why we are here! Public view-ability of the growth habits and true value of these wonderful plants has begun to create a greater demand for the species that are desirable landscape plants as well as irresistible collector plants. 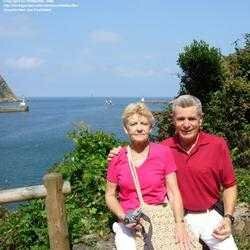 "Wife and me on the north atlantic coast of Basque Provincial Spain. 2005. A very lovely place in Europe that loves USAers"